Let’s get right to the point: If you are already advertising your e-commerce company through AdWords, a Google Shopping campaign should be a no-brainer. Not only do Shopping campaigns give your products more visibility but they also have a higher conversion rate than text ads. But I might be getting a little ahead of myself here. Before I go into why you should set up a campaign, let me dive a little deeper into what exactly shopping ads are and how they work. Google Shopping ads are displayed when a user includes a product in the search query. A quick product search will show how these ads appear in the search results. As you can see, Shopping ads show up with images and prices of the product that was searched and appear either above or to the right of the text ads. They also feature unique selling propositions like “Free shipping” and “Lifetime returns” or product rating extensions that show the average number of stars the product is rated by consumers. We’ll go into exactly how to set up a shopping campaign in our next few posts, but there are two basic components. The first step to setting up Shopping ads is to upload your product feed to your Google Merchant Center account. 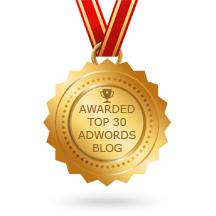 From there, everything else related to your shopping ads can be managed in AdWords. You can advertise through two different kinds of Shopping ads in AdWords: Product Shopping ads and Showcase Shopping ads. 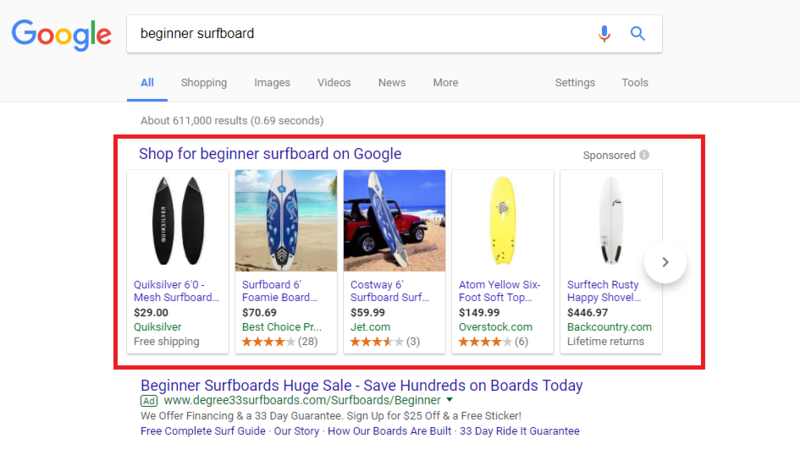 Product Shopping ads show up like the surfboard example from earlier, and display an image of your product, title, price, name of your business and some additional enhancements such as special offers like free shipping. 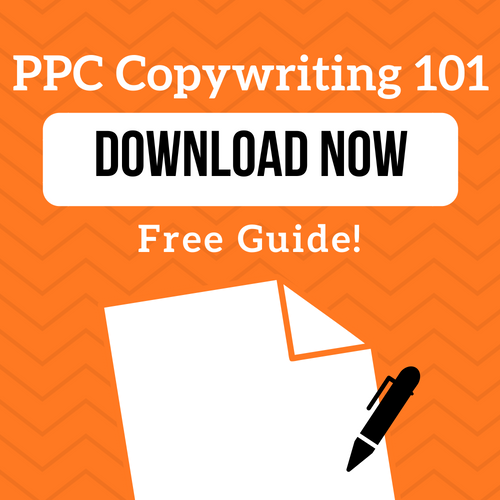 They are charged every time someone clicks on your ad, similar to text ads. Showcase Shopping ads, on the other hand, group together related products and are charged on a cost per engagement basis. You’ll only be charged when someone expands your ad and then clicks on a product within the showcase. These new Shopping ads were introduced with the New AdWords Experience. See them in action below! Unlike text ads, Shopping ads don’t use keywords in determining when ads will be shown. Google instead use the product data you uploaded in Merchant Center to match your ads with relevant search queries. So why do you need a Google Shopping campaign? Visual impact – Shopping ads are perfect for grabbing the attention of the consumers who don’t have time to read text ads. With a quick scan, a user would be able to see the name of the product, what it looks like and the price. Not only are these ads more eye catching but consumers who click on them are going to be more likely to convert since they already know the key details about the product. Higher conversions rates – Speaking of conversions, a 2017 Digital Marketing Report from Merkle found that Google Shopping ads saw higher conversion rates on both desktop and mobile when compared to non-brand text ads. 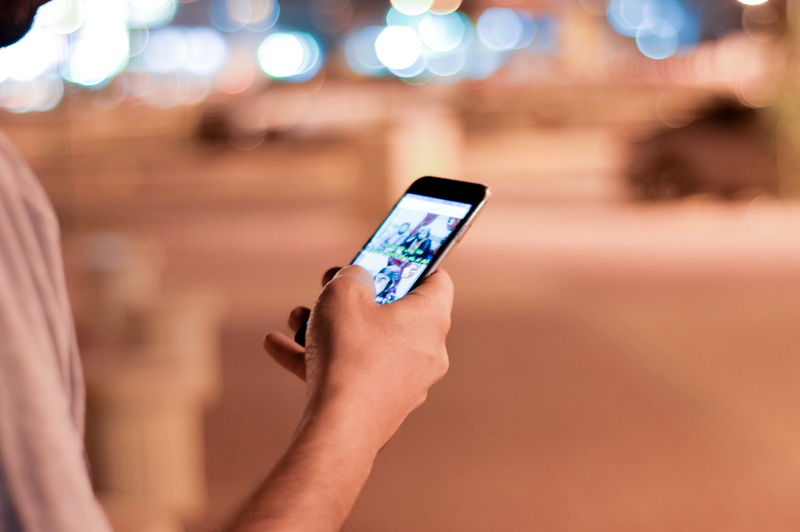 The study found that the conversion rates were 21% higher on mobile and 30% higher on desktop. Brand reinforcement – If you are bidding on keywords that your Google Shopping ads are also showing up for, there is opportunity for your brand to appear twice in the search results through your Shopping and text ads. Not only does this take up more real estate in the search results, it also reinforces your brand in the searchers’ minds. So now that you know why you should set up a Google Shopping campaign, our next few posts will show you how to set up your first campaign. Check back next week and we’ll show you how to set up your product feed in Google Merchant Center!